Today's Quotefall Puzzle features a quote by Knute Rockne. Click image for full size. To solve the puzzle, enter the letters in the top half of the puzzle into the white squares on the grid pattern below, staying in their own columns, and be used exactly once. The black squares in the grid (which represent spaces), as well as punctuation or numbers in gray, are not to be used by letters. Some words will continue from one row to another. 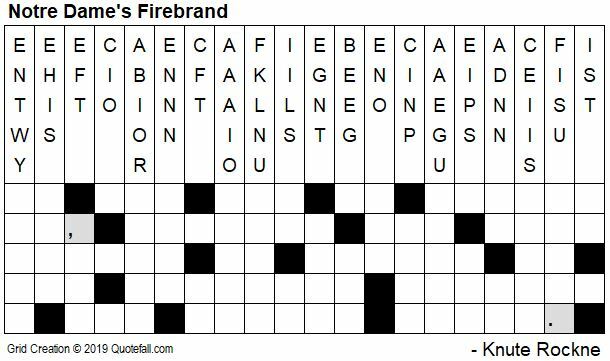 For more detailed instructions and techniques, go here: How to solve Quotefall Puzzles. Due to issues related to front page exerpt formatting, all hints and the answer is provided in the reply comment below. Highlight yellow-ish colored words to reveal hints and answer as needed. Hint words may be included more than once in the quote. ANSWER: WE CAN ALL BE GENIUSES BECAUSE ONE DEFINITION OF GENIUS IS THE INFINITE CAPACITY FOR TAKING PAINS. Thanks. This one took a bit of work to do, for whatever reason. Even easier would be exposing the answer in the reply.